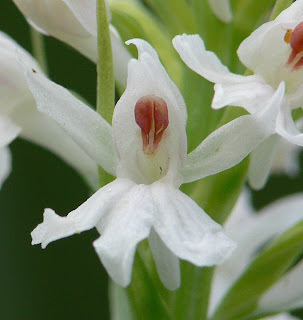 Banstead Botany Blog: White Orchid! 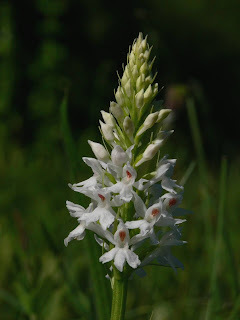 Our local Common Spotted Orchids (Dactylorhiza fuchsii) are just coming into flower at the moment and at one site, although only a small number of plants are present (1-200), the flowers are remarkably variable both in colour and in patterning. This year there is an addition, a single pure white spike has appeared. It does seem to be completely white with only the pollinia showing any colour at all, so I suppose it could qualify as var.albiflora, but if I did that I would have to come up with about 50 names for all the other colour variants present so I will just stick with "a white one". This is the first time I have ever seen a white form of Common Spotted in forty years, despite it being supposedly common, so I was quite chuffed to find it locally especially as it is so attractive to look at. What a subtle and refreshing beauty. Very smart....is there a greater number of variants around it, or is it a one-off? The flowers of other plants nearby are very variable in both size and flower pattern/colour. At other nearby sites there tends to be less variation.